Here we go with another take on a lethal dose. I thought we could throw a caption below it if we wanted, or I could add the bottom half of the mouth, which ever people think would turn out. Also this one being color adds a little extra pizzazz I think. I tried to keep the colors along the lines of what we've got on the site already. Alternate: I just couldn't get the tongue to come out right, but this was the best of the bunch. I added a sneer for some attitude. Honestly if I had to pick I'd stick with my original, maybe just change up the colors. 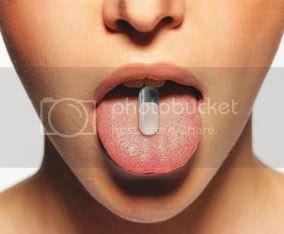 Like have the pill somewhat slanted at a side to make it so the pill is about to be swallowed/eaten. Haha, not a bad idea at all. for some reason the idea of Venom dying from taking a pill cracks me up. I think the only problem with that might be the pill, and hence the LD50, would have to get smaller/harder to read. I have no expertise in graphic/digital art but I can free hand and sketch pretty well, give me a little bit and I'll take some pics and post them here. I'm really liking the whole pill/mouth theme. Props to you for that idea bro. I just tried drawing a logo from the pic utopi posted and then combining it with yours but it didn't turn out well at all, so it got me thinking maybe biting down on the pill would work out better. Edit : gimme 5 mins gonna upload two things now. I'm sorry if they don't do anything though, but I tried . Pretty slick Waffles. Let me see what I can do. I can't promise it will get done today, but I should have some more time over the weekend to make it happen. It's all good I know sometimes ideas just don't come up so it's hard to even start on a project, especially one as defining as the guild logo. I wanted to submit an entry but I have no knowledge when it comes to computer graphics and such, so it would end up all being free hand. Instead I just want to help out with the process as much as possible. If we get an idea rolling then everything else becomes easy imo. It's reminding of things like the Rolling Stones logo and the movie Heavy Metal. Not that that's bad thing! I think that more modern coloring would be good for differentiation, though -- black goth instead of red lips or something. Or if you could find a way to make/color sith lips. Ok, added the alternate version to the first post. Enjoy. I would say reverse the tongue and put it behind the bottom teeth/pill, or just take it out altogether because I'm loving that sneer haha. Really great work man. This entry can be viewed as a Mouth/Pill concept. The shape of the mouth, color of the lips/pill, tongue/no-tongue can all be pretty much changed to whatever people want. SimplePortal 2.3.5 © 2008-2012, SimplePortal — Page created in 0.236 seconds with 32 queries.